March madness…. in the garden. With Spring only 3 short weeks away (yikes! ), it’s time to get serious. Come by the Slow Food Office to pick up seed packets. We still have a fairly plentiful supply left. Clean out shed or storage container. Assess tool condition. Check hoses. Based on the soil test already done (hopefully), add soil amendments a few weeks before planting. Create a planning chart to organize planting and optimize yield. 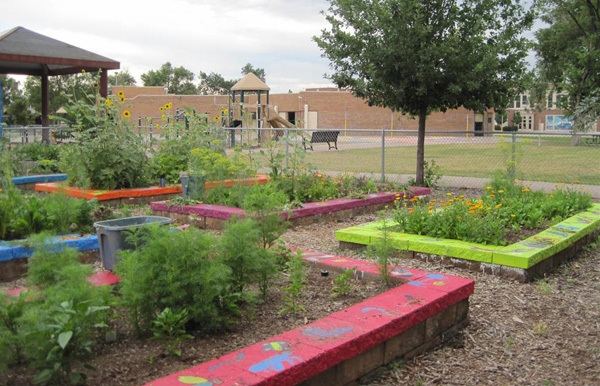 Consider Garden to Cafeteria and Youth Farm Stand program needs. If you haven’t already done so, start (now) cool season crops such as broccoli, cauliflower, Brussels sprouts, cabbage indoors for transplant mid to end of April. Cool season seedlings – broccoli, cauliflower, kale, Brussels sprouts, Swiss chard- will be available early April. Direct sow in ground cool season (hardy) crops such as arugula, lettuce, spinach, peas, kale beginning mid-March through the end of April. Start warm season crops (tender) such as tomatoes, peppers, eggplant indoors at the end of the month for transplant mid- late May. Hold off on melons and squash until mid to end of April or they will get unmanageable and difficult to transplant. Begging is not beneath me. PLEASE get in the habit of entering your garden-time data. WE NEED THIS INFORMATION! *If you’re a gambler, hedge your bets and plant early. Precipitation increases in Denver during March. Snow will not hurt cool season crops. Remember, however, germination rates may be slowed with cold soil temps. Try warming the soil for quicker germination by laying thick black plastic several days before planting.